Introduction: The Large Hadron Collider (LHC) near Geneva, Switzerland, took twenty long years in the making and was designed to investigate dark matter, the big bang and the other mysteries of the early universe. A technical glitch has forced scientists to shut down the huge particle-smashing machine for at least two months. Ganesha finds astrologically what has made this ‘Big Bang’ machine halt for the time being. The Ascendant lord Venus is placed in the twelfth house of losses and worries and is debilitated there in. This unambiguously indicates that the project may not be successful. it may lose out precisely on what has been expected to be discovered from this giant exercise. Notice that this indication is further supported by the lord of the twelfth house Mercury being placed in it making the loss point more dignified and signified. Additionally Mars as a Marak (1), is placed in the twelfth house too, indicating early demise of the project. With all the above negatives there is no scope for any positive outcome, as there is a stellium (2), in the twelfth house, making losses and worries, accidents and technical glitches the norm of the experiment. Now, someone may want to ask: what about the Aries Point Ascendant (3). Well, the actual reference of the Aries Point is mostly towards being famous and that’s all, it never indicates one to be successful, and fame the project will definitely have but it will be so for all the wrong and negative reasons not for any positive outcome. Further, Ketu a separative planet, is placed in the tenth house of success, eluding success for the project. On the other hand, Moon the lord of the tenth house is inconjunct to its own house, which is a certain feeler that there will be many hardships and difficulties in achieving success. So, is there no hope? There is, but not of significant nature as with reference to the expected gains and success from this project. How come there is some scope? Well Moon and Jupiter are in conjcuntion in the third house with Pluto. Jupiter is the lord of the third house of efforts and is posited there in indicating efforts and is in conjcuntion with Moon, it means efforts for success is the primary intention but as Pluto, a strange planet, is placed alongwith the two planets Moon and Jupiter, the efforts may be in the wrong direction or flooded with strange complications and contradictory results and findings. Still, as Moon and Jupiter are two naturally benefic planets, there seem to be strange theories coming out which will lead to a new experiment or may cause the base and need of a greater and completely new project. The other supporter of some positive outcome is the placement of Sun and Saturn in the eleventh house of gains. Sun as the lord of the eleventh house placed therein itself and Saturn as a Yogakaraka (4) for Libra Ascendant indicates strong support for gains out of this project. In a nutshell, the trine aspect of (Moon, Jupiter & Pluto) with (Sun and Saturn) and strong influences of Jupiter being Swagruhi and Sun being Swagruhi, lead to some hope for gains and not a complete loss. If this were not present, Ganesha would have said that the Large Hadron Collider experiment would be in the future nicknamed as the Large Cauldron experiment. See the natal destiny that this project has. Sadly, it has a bad natal horoscope and looking at the Vimshottari Dashas, the project started in the Mercury Antardasha in Venus Mahadasha. Venus as described above is debilitated and in the twelfth house of losses and Mercury is the lord of the twelfth house so the period till December 2010, will be tough for the project, with many communication problems and glitches, which may hamper the continuity of the project, akin to what diseases, of a serious nature may do to a native. The project may be shut down for various reasons for short to medium terms till December 2010. After that, in the Ketu Antardasha, till February 2012, there t direction will be lost as regards the main aims and intentions of the project, because Ketu, the Antardasha lord is placed in the tenth house of success, of the project, hampering its growth, success and achievements. Ganesha feels that the difficulties and glitches that may hamper this project are more technical in nature, with technical faults, electric faults, fires, communication faults, miscommunication, tremors and quakes. 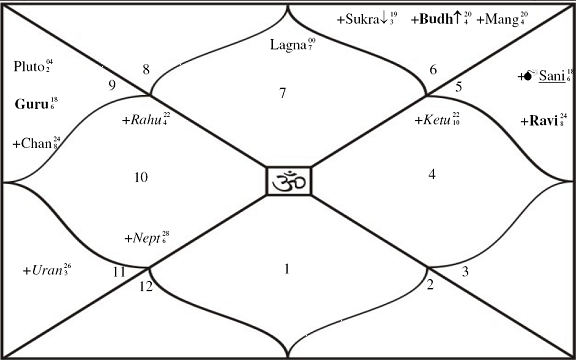 All these glitches seem to crop up because the stellium is in the twelfth house of losses and is caused by malefic planets, malefic, because of the lord ships of these three planets (Mars, Venus and Mercury) and the trine aspect of Rahu to these three planets and the square aspect of Moon to these three planets as well as due to the square aspect of Jupiter to these three planets. The glitches may be repaired as and when they come up but the project has no potential for avoiding any glitches or difficulties as there is no positive aspect to the twelfth house and neither the planets therein. Ganesha foresees one major problem in November 2008 through mid December 2008. A Major shutdown or fire or electrical line problems along with communication hiccups may be possible. Summarily Ganesha has to say that the project will definitely not be able to achieve its main objective, it will face many technical problems and come up with difficulties but it will also come up with new theories and observations which are not expected and will be a complete surprise, leading to a new experiment which may be initiated 11 years from 10th September 2008. Marak means a planet who is the lord of the second house and the seventh house. It is considered as a death inflicting planet. Stellium means a conjunction of three or more planets. Stellium occurring in which ever house increases the results of that house, which become a prominent feature in the horoscope, events in life usually towards the nature of the house the stellium is place in. Aries Point means 00 degrees of Cardinal signs, aries, cancer, libra and Capricorn, which usually indicates fame. Yog Karaka means a planet who becomes the lord of an angle and a trine, both, here Saturn becomes the lord of the fourth house (angle) and the fifth house (trine). Description: The world’s largest atom smasher, The Large Hadron Collider (LHC), will be delayed at least two months because of an electrical malfunction. To unlock secrets about the universe and its origins, the scientists are earnestly working to restart it. Ganesha foresees the future of this machine.